The density of Monwabisi Park will require residents to move in order to create space for new buildings and services. Unfortunately, the space created from relocated residents will not provide new housing. This forces a close examination of the reasons for a community centre. It must be asked whether or not a community centre is worth displacing people from their homes. The purpose of the community centre is to promote a sense of group ownership as well as provide much needed services to the community as a whole. Group ownership should cause a sense of shared responsibility for the new communal spaces created as well as the homes that are eventually built. If the community members feel that they own the buildings they occupy there will be a greater probability of upkeep. The following lists possible answers to the relocation problem of residents. Living with family / friends for the time necessary to build: An option that is worth exploring for a small family or single person is living with family or friends. This is another way of having a vacant shack without having to provide housing to the displaced residents. The disadvantage with this option is that it may only be viable for small families that know people capable of accommodating them. It would be the cheapest and easiest solution, however, especially if housing can be built fairly quickly. Buying the resident’s shack: The Indlovu Project has already purchased shacks for the purpose of developing the land. This is a viable option, but may cause strain in a community overrun by poverty. The price for a shack and plot is R7000. In a place like Monwabisi Park this amount of money may force a person to make a rash decision before fully understanding all of its implications. Temporary transition housing: The initial stages of redevelopment will require people to lose their shacks before there is new housing to accommodate the residents in. The community centre will not be providing new housing so the construction will not result in a place of accommodation for the displaced residents. Therefore, spaces must be found for displaced people to be located. One option is to build temporary accommodations along an undeveloped edge of Monwabisi Park. The process of building temporary housing could serve as a model for how the community members and redevelopment planners can work together. This option would be necessary for the community centre construction because it will not result in new housing. The problem with this proposed solution is the cost. In order to make this a viable option the temporary housing must be located in a place that can be used for several different redevelopment seeds. There also must be a proposed purpose for the temporary housing once the redevelopment no longer has a use for the building. Some possibilities are community spaces, guest house or rental dorms along with other possibilities. Construction time when the shack is vacant: The community centre is a service to the community and should not create such a burden that the process seems unnecessary. For this reason as few people as necessary should be displaced from their homes. Many residents of Monwabisi Park are originally from the Eastern Cape and return to their homes during the summer holiday (Poswa & Levy, 2006). During this time of vacancy building can occur without the need of displacing residents from their homes. Unfortunately, because of the labour needed for the ecoBEAM building system this option may not be viable. It will depend on the number of people left in the settlement during the summer holiday that are willing to help with the construction. As the construction is for a community centre the people of the community must be able to help in order to feel that it is their own. Use vacant shacks for temporary accommodations of displaced residents: At any given time in Monwabisi Park, there are some number of vacant shacks that might be used to accommodate residents located in a redevelopment area. This option allows people to stay in a stand-alone house without the need of building a new structure. There is a possibility that some residents of Monwabisi Park would offer shacks for a small rental fee. This would provide more options for residents to move temporarily from the area of redevelopment. The Indlovu Project may be using this option in order to create space for new housing behind the community centre in Section C. The problem with this option is that it depends on too many factors to be reliable. But, when the proper circumstances are in place this option can be very valuable. In order for the process of redevelopment to be sustainable community members must be active. The ecoBEAM Technologies building system allows, and actually encourages, the use of community members for construction. Because of the economic conditions of Monwabisi Park outside construction workers and contractors add expense and reduce economic and skill development benefits within the community. The theory behind community involvement is that residents can empower themselves and the community by being involved in the redevelopment. The city of Cape Town has implemented housing projects that promoted community involvement to great success. 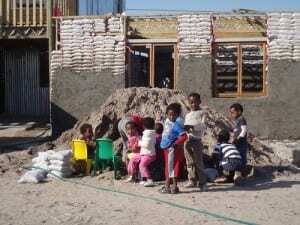 The People’s Housing Project (PHP) strives to allow people to build their own houses with the aid of some technical expertise and is a strong supporter of community run housing. PHP removed the mechanized delivery system of previous redevelopment efforts, and rather focuses on community run housing delivery (Zonke, 2006). Past redevelopment efforts have failed because of a lack of community involvement. It has been stated that there are five different levels of community involvement. These levels describe the amount of input community members can have with regard to the redevelopment of their community. The levels of contribution are to inform, consult, involve, collaborate and empower (Xali, 2005). Each increasing level allows more collaboration and input from the community. Finding the correct balance is the key because too much community involvement will also leave the redevelopment unsustainable. According to interviews with Mike Tremeer and Robert Taylor of ecoBEAM community opinion can flood a planning session because there will simply be too many ideas. Community centres have become the centre of the redevelopment seeds. By creating community space that everyone can share each section of Monwabisi Park will have the start of a redevelopment seed. Given the function of community centres (soup kitchen, youth centre, crèche, health clinic and guest house) the residents of all sections can come together to allow the project prosper. The community centre should start the building of communal ties that can then be extended when housing begins. The importance of community involvement cannot be overstated. Although EcoBEAM requires some skilled labour it will not be a viable option if the unskilled labour of community members becomes unavailable. At the very least, community members must show a vested interest in building the structures to better the community.